Hi, I am interested in your 1968 Mercury Cougar XR7 listed on Autotrader for $19,999. I'd like to get more information about this vehicle and confirm its availability. 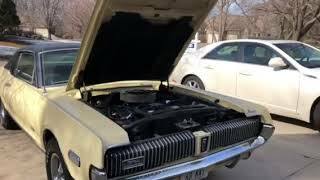 1968 Cougar XR/7, 390 Big Block rebuilt mild cam, with Edelbrock Performer RPM manifold, Demon 625 Vacuum Secondaries 4bbl. Dual exhaust with Flowmasters. Transmission rebuilt with wide ratio first gear. Saxony Yellow with Black vinyl top, saddle leather interior, steel styled wheels.